I have no fear of drowning, it’s the breathing that’s taking all this work. I was laying in a bed around midnight but before I drifted off to sleep, I said a few little prayers. Those are often times my most honest conversations with the Lord. In fact, there are days I get down on my knees to pray before going to sleep and after the “Amen,” I climb in bed and that’s when the real praying begins. I confess to Him my desires, hoping that Psalm 145:19 is a promise I can count on. I’ve leaned on it in the past and God did not fail me, so I put a lot of hope in that being the case each time I cast my cares on Him. 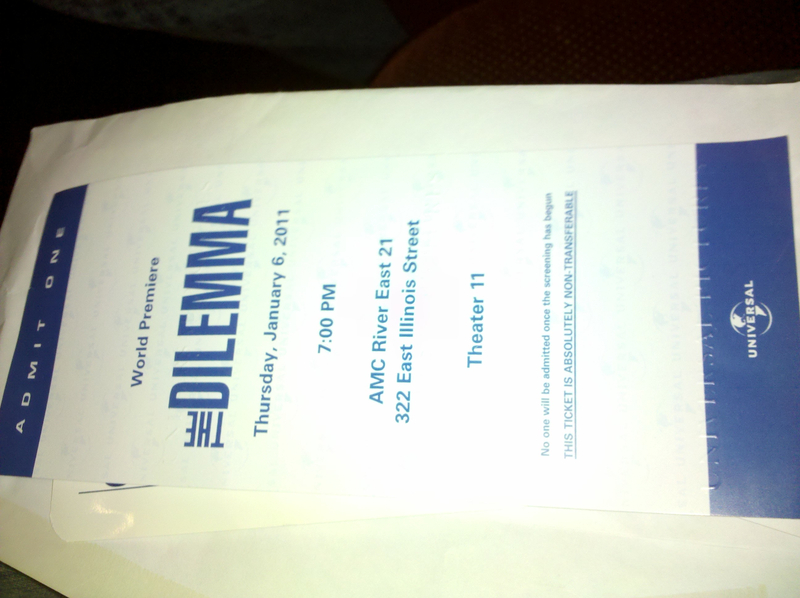 This particular midnight prayer came after attending the Chicago world premiere of “The Dilemma” starring Vince Vaughn, Kevin James, Jennifer Connelly, Winona Ryder and Channing Tatum. There’s a scene in the movie where Vince Vaughn’s character has a honest conversation with God. He says something like this: I know I’m supposed to give you things, but I just can’t give you this.” I was surprised by the emotional scene in a movie that was marketed as a comedy. I could’ve been Vince Vaughn sitting on the bus bench in that scene. He was in the middle of a dilemma (is that surprising?) without a good solution to fix it. When he was at his lowest, he turned to God for help. I loved that. Returning to the hotel afterwards, I watched a little television, then went down for the night. As I prayed, I thought about the things that I’ve given over to the Lord, and the things I haven’t. What I’m holding with an open hand, and what I won’t let go of. I was compelled to raise an open hand as I laid there, to loosen the grip on what I think I have control over. But to open my hand, to let go, is to no longer have control. It’s living out of control. I didn’t raise my hand that night. I’ve chosen to hold onto the snake that keeps biting me for another day. Maybe the venom won’t kill me. When will I trust Him enough to open a raised hand so he can put bread in it? How long till suffering makes me steadfast?